Ateriet means the eatery in Swedish at least if you spell it Äteriet. This place is all about food and everything you could imagine being related to food, like great recipes, food packaging, art, design, drinks, ingredients and much more. 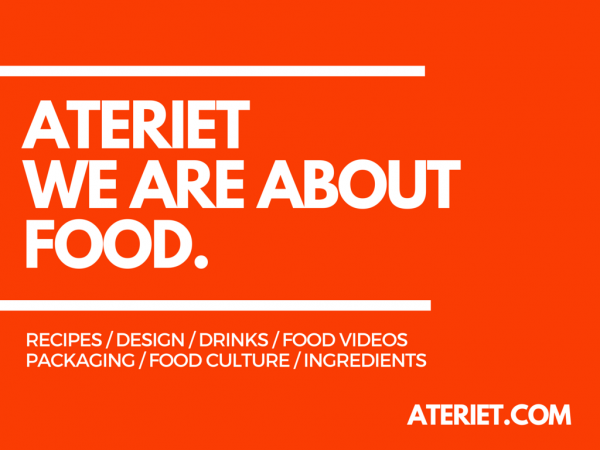 Ateriet was founded in Sweden but we consider the world of food our work of field so you can find things from all over the world here. The only thing in common is that it is all about food. So keep coming back to Ateriet, your source for everything that is fun about food! About the content: This site wants to be an inspiration to anyone interested in food, that includes recipes, photography, packaging, commercials, design, art and anything you could possibly connect to the world of food. The content is sometimes created by us, sometimes found on company websites, press releases, pinterest and so on. It is our intention to always give credit to the creators and it is being done by linking back to our source. Should you feel that we have posted anything that is not permitted or someone is wrongly being credited for someone elses work please contact us so we can correct or remove such content. Also, we only post things we like, Ateriet is only about the positive stuff so if you are featured here, that means we like what you do. If you like please contact us or connect with us in social media. I was doing some research for packaging and came across your site. I am looking at a packaging boxed packaging and on the inside have a high moisture barrier and oxygen barrier material so the shelf life can be for 6 to 8 months. Hello Edrich, I mostly write about the design on this website. I suggest that you contact a local packaging company and explain what you are looking for. Good luck!